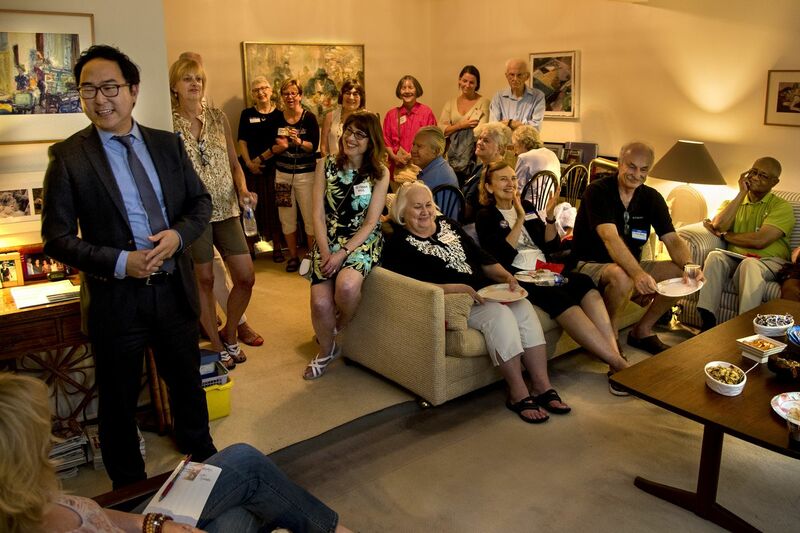 Andy Kim (left) speaks during a fund-raiser at a supporter’s home in Mt. Laurel Aug. 20, 2018. A Democrat, Kim is campaigning in the competitive Third Congressional District challenging Republican incumbent U.S. Rep. Tom MacArthur. Seated on the arm of the sofa is retired physician Eileen Hill, 64, of Mount Laurel, who after President Trump’s election started a chapter of “Indivisible,” through the South Jersey NOW-Alice Paul Chapter. Andy Kim is telling the Wegmans story again. He's 36, a Democrat locked in a dead heat for a key New Jersey congressional seat, but this story, like many a South Jersey tale, starts at a Wegmans. "I just put out a message on Facebook: I'm going to be at the Wegmans, second floor, if you want to come by," Kim tells the people crowded into a Mount Laurel living room on a late-August night. "I just went downstairs, bought, like, a thing of ice tea and a couple of cookies, and I thought maybe five or six people would come by. And I think like 60 or 70 people show up, and we had this impromptu town hall in the middle of the Wegmans. "Which," he adds, "the manager afterward told me I should never do again." It's a laugh line, but the promise of that event a year ago is still with Kim as he steers his campaign through the winding roads and busy numbered routes of New Jersey's Third Congressional District, trying to unseat Republican Rep. Tom MacArthur, who has voted with President Trump 94.4 percent of the time, according to statistics compiled by Nate Silver's fivethirtyeight.com. "That energy that was there a year ago is still with us, multiple times bigger now," Kim is saying. "It is incredible what energy is out there, from the Women's March to the energy right here in this room." It is in these living rooms, bars, church basements, and even supermarkets of the district — comprising suburban Burlington County and the more leisurely communities of Ocean County to the east — that Kim is trying to wake up the district's Democrats, who have not had a consequential role to play in national politics in years. In 2016, the Democratic nominee raised $600 in challenging the first-term MacArthur, a former insurance executive who is one of the wealthiest members of Congress. This time won't be as easy, MacArthur knows. He and the super PACs supporting him have been relentless, running TV ads calling out Kim for taking a tax break on his D.C. condo after moving back to New Jersey, and suggesting the Marlton-born and Cherry Hill East High graduate is "not one of us." MacArthur, 57, born in Connecticut, moved from North Jersey to Toms River to run for the seat vacated by former Eagle Jon Runyan in 2014. Kim, the child of South Korean immigrants — his father a polio survivor and orphan who earned a Ph.D. in genetics, his mom a nurse — is running as a child of Marlton: "It's where I hit my first home run," he says, "earned my first paycheck at the Barnes & Noble at the corner of Routes 70 and 73. … This district gave my family all of that opportunity, allowed me to dream big." Kim, a Rhodes scholar, spent a decade in Washington, working first under President George W. Bush as a conflict specialist at the U.S. Agency for International Development and then, after earning his doctorate in international relations at Oxford, under President Barack Obama. He was a State Department foreign affairs officer and an adviser to Gens. David Petraeus and John Allen in Afghanistan. Between 2013 and 2015, he handled Iraq at the National Security Council. He moved back to Burlington County with his wife, a tax attorney, and their two children, Austin, 3, and August, 1. Now he logs the miles on his gray Ford Escape, juggling child-care duties. As he campaigns, Kim stresses that the Third District race is one of the most competitive in the nation and could determine whether Democrats take control of the House on Nov. 6 and gain leverage against President Trump. "These are people that have been my neighbors," he said. "And they are people that have a lot of concerns, a lot of life happening to them every single day. Frankly, what they're looking for in Washington is a steady hand at the wheel. They don't want this division and chaos." Andy Kim (rear) walks to his car — parked far down the street — after he attended a fund-raiser at a supporter’s home in Mount Laurel last week. A Democrat, Kim is campaigning in the competitive Third Congressional District challenging Republican incumbent U.S. Rep. Tom MacArthur. He is not accepting corporate PAC donations, and has raised more than $2.5 million, with an average donation of $34. Kim says people in both counties worry about prescription costs, and points to MacArthur's role in the attempted repeal of the Affordable Care Act: authoring an amendment that would have permitted state waivers of some requirements, including the "essential health benefits" provision. Critics said it would have made premiums for those with preexisting conditions unaffordable. MacArthur was the only New Jersey congressman to vote for the tax-cut package, which caps deductions on state and local taxes at $10,000. The average deduction in New Jersey is $18,000. He said last week he has "zero second thoughts" on either vote. "The economy has proved me right," he said. Those votes and the continuing unpopularity of Trump in New Jersey led national Democrats to target the Third District. MacArthur said in an interview after a panel he convened in Marlton on the opioid crisis (he is cochair of the House Bipartisan Heroin Task Force): "It might surprise my opponent to realize that the president doesn't send us notes every day when we vote three times a day saying, 'Please vote this way.' I vote with the president when I can, and I have opposed him, opposed him on Russia sanctions, on high-intensity drug-trafficking areas." Republican Congressman Tom MacArthur of New Jersey’s Third Congressional District, being interviewed on the patio of the Gibson House Community Center in Marlton. MacArthur needs no prompting to fire away, accusing Kim of exaggerating by saying he "served" in Afghanistan, labeling him part of the "far, far left" who poses as moderate. "Andy Kim is a liar," he said. "He's cheated on his taxes. He had to repay Washington, D.C. He has embellished his record, trying to make himself sound like he served in the military. " Kim, who says he would not support Nancy Pelosi for House speaker, says he considers his life's work, including the time in Washington and Afghanistan, public service. His campaign has pounded MacArthur for taking $400,000 in donations from prescription drug and insurance companies. The race promises to intensify. New polls show Kim down by a point, despite the ads from the Congressional Leadership Fund, a Republican PAC that has set up shop in the district. The Third voted twice for Obama and then for Trump by 6 percentage points. Kim's supporters are deep into the battle. He says he has 1,200 volunteers within the district, and is recruiting in Philadelphia and in nearer towns like Voorhees and Cherry Hill, where Democratic seats are safe. "I enjoyed listening to him," said Mary Bridges, a 40-year Mount Laurel resident and retired teacher, speaking after the event in Judy Buckman's living room with her husband, Al, who is retired from Amtrak. "I'm going to start working for him tomorrow." The next night, Kim was again in a crowded space: the basement of the Black Sheep Bar in Center City, at an event sponsored by the progressive groups Moving Philly Forward and Swing Left. Kim drank a Yards draft and urged people to view the Third District as the place where they could make a difference in the midterms, just a train ride or drive away. "It's really important, even though Andy's over in Jersey, across the bridge, that we are supporting candidates like him who are in some tough battles right now," said Moving Philly's Rahul Munshi. Democratic candidate Andy Kim, running in New Jersey’s Third Congressional District, campaigning at Black Sheep Bar off Rittenhouse Square in Philadelphia last week. The groups are mobilizing in targeted districts attempting to flip the House to Democratic control and anticipate massive canvassing operations before Nov. 6. "We're going to have the largest, best-funded Democratic campaign in the history of this district," Kim told people as he worked the room. Julie Van Duzer of Medford came with her brother, who lives in Philadelphia, and brought some mailers she'd gotten, including one headed: "Something is Real Fishy about Andy Kim," with a photo of dead fish in ice. She considers the mailers offensive, typical of the current political climate, and said they left her determined to unseat MacArthur: "There's nothing more that I'd like to do than take him down."